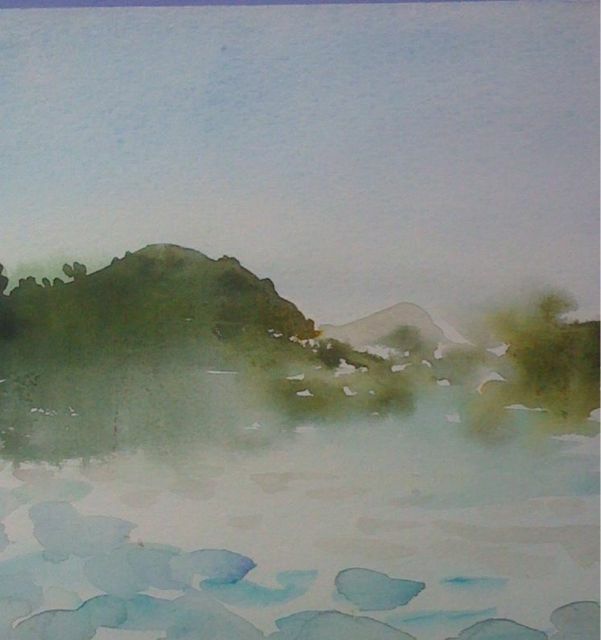 This blog covers the weekend just gone there were several painting that I did but did not get a chance to blog as there were so many other things competing for my time and my blogging partner with the technical expertise. The humanist non-wedding preceded by a civil ceremony has been and gone. It occurred to me that it must be more difficult to get through saying your lines when you have written them yourself because they are much more personal. I was very pleased with my dress and the green toenails, the non-bridesmaids were spectacular in shocking pink polka dotted dresses with black feather fascinators and netted gloves. The **ide (look I avoided the b-word as requested) had a dress by Vivianne Westwood which was gorgeous; the material twisted and folded into the shape of the body but had a magic effect once on. It was both modern and grand Edwardian in one object. There was a lot of wandering round the Essex village from house to Parish Hall and finally back to our B&B in the Old Police House; it was, unlike some villages, quietly busy: an artist in the street accepting a commission, a bus turning outside the house, a butchers, a bakers and some other shops, people stopped in the street talking, cyclists making their way slowly to the allotments. I think the atmosphere is so pleasant because it is the end of the road; to continue east from Tollesbury you need a boat. No1 son had a lovely time as he has decided alcohol is interesting, it was not till various people had reported back to me that the full picture emerged. Reports of Pimms added to fruit cup, glasses of wine filched from tables behind my back and glasses of red wine downed in one that I got close to an idea. He held it remarkably well and lived to eat five puddings that evening. Oh well he might put on some weight. No2 son also had a lovely time but it was more to do with finding a wealth of friends and family to tease and run around with. DIY dad did the barbeque the next day and got to inspect the magicians body cut in half act from the stage. He couldn’t work out how it was done and the temporary assistant was not giving any secrets away afterwards. We started to pick the Victoria plums in the garden as some were dropping , our pears are now ripening at the speed of light and need eating, drying or freezing. The early apples are starting to tumble off the tree when you go to pick one. In Essex they had had a fantastic crop of greengages which made me jealous as it is one of my favourite fruit. I need to spend half a day on fruit preservation. The pictures here are two sorts , firstly there is a picture of another fungus that has sprung up and then there are some reworking of the view from the quayside in Sibenik. 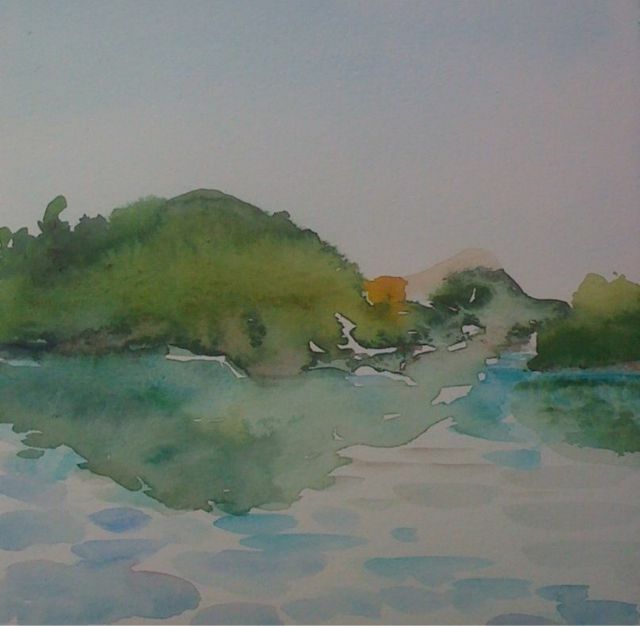 I sketched it in about five minutes while waiting for the bus quite early in the morning, there is a sea passage between the two islands which leads out into the Kornati archipelago. I liked the original sketch for its atmosphere but felt the reflection was in the wrong place. I have made about four attempts to rework it I will publish them even though none of them are definitive. I loved this and felt it very apt for A and R the non-bride and not quite groom who got married at the weekend. Strangely I once sang it on stage with an American singer who moved away to my now husband’s aunt’s town where Aunt Sue hired her to sing at her fortieth birthday…. the world is smaller everyday.